Restaurant Skáidi has nature as a pantry. In the kitchen we cook food from primary products in a pleasant “Nikkaluokta atmosphere” to the beautiful view. 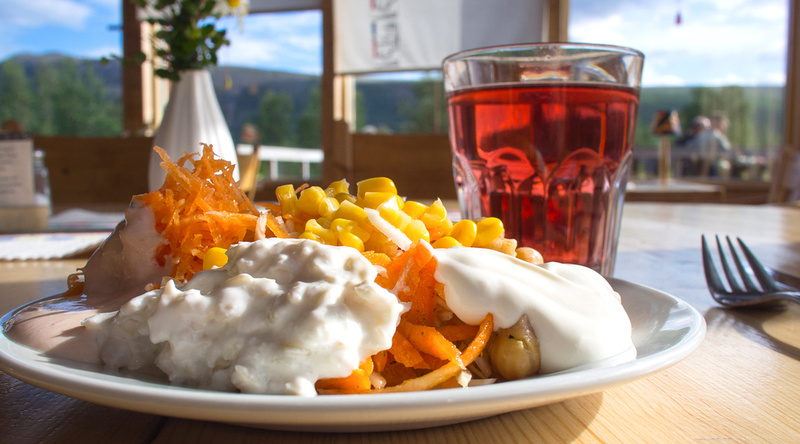 Taste and enjoy good food with local ingredients, fish from the mountain lakes, reindeer, moose and berries. The view of the mountains is free of charge. We serve breakfast, lunch and dinner every during the season. If you are a larger group or may want to celebrate someone you can book a table and choose one-, two- or three-course meal from the seasonal menu. We are fully licensed with selected beverage packages to our menus. Sit a while, have a cup of coffee and good pastries and enjoy the wonderful mountain views.